You’ve all done well building up your bases, carefully selecting the Bots and Mods that stand staunchly in defense against the raiders of other Commanders. Now, we are ready to introduce you to the next batch of Mods to come to New Quintessa! This week will see the debut of 3 new Mods for you to add to your defenses. These Mods will be making their initial debut in a special Crystal offer, and may later be available in different areas of the game. Following in the footsteps of Orion Pax, even the meekest of bots, in the darkest of times, can find the strength to prevail while wielding the power of the Primes. If the Defender's Base Attack stat is less than that of the opponent's, the Defender starts the fight with a permanent 25~45% Attack Up buff. If the Defender's Base Health stat is less than that of the opponent's, the Defender starts the fight with a permanent 25~45% Resistance Up buff. Gains a 20~26% Resistance Buff for 4 seconds. - When the Defender begins to falter, the bot taps into the power of the Primes. 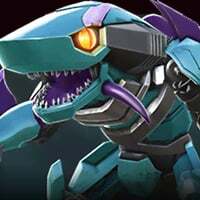 - When the Defender drops below 20% Health it receives a 5~15% Attack Up buff and a 5~15% Resistance Up buff for 10 seconds for each alive bot on the opponent's team. 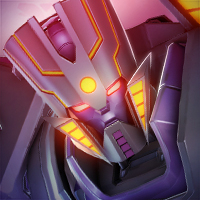 Good Matches: Arcee, Ratchet, Mirage, Windblade… Bots with lower base stats will benefit the most from this Mod’s abilities. 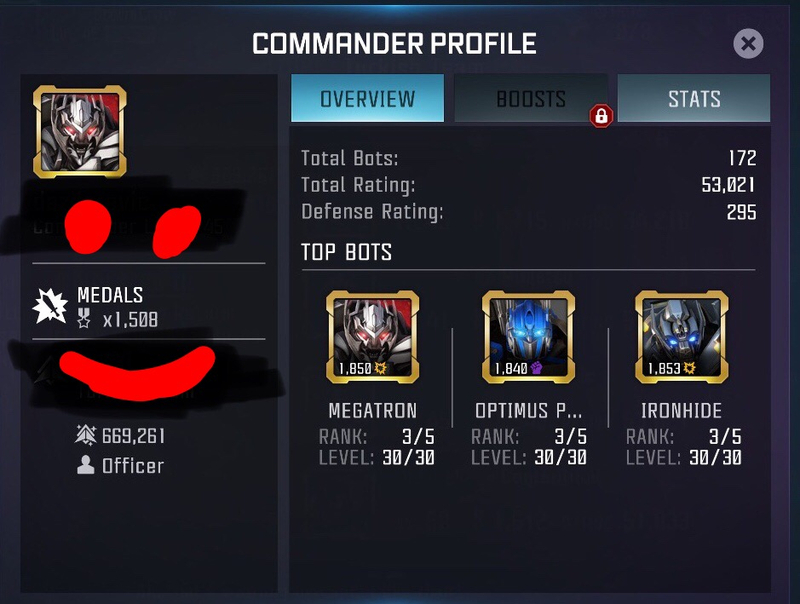 Bots with higher base stats will not benefit as much. A seemingly-innocuous programming interface capable of mechanical annihilation in the hands of Tech Bots. The strength of Repair Buffs is increased by 30~67% and further increased by 30~67% for every 25% missing health. The strength of Power Gain Buffs is increased by 30~67% and further increased by 30~67% for every 25% missing health. The strength of Shock Debuffs are increased by 50~112% and further increased by 50~112% for every 25% missing health. Activates Tech Shielding, capping the maximum damage of an opponent’s attack to 2% of the defender’s max Health. - Activates Tech Shielding when filling a Power Bar. Whenever activating Tech Shielding, if any Shields are active, it also activates an Attack Buff. - Activates Tech Shielding when filling a Power Bar. Whenever activating Tech Shielding, if any Shields are active, it also activates an Attack Buff, increasing Attack Rating by 40% for 4~10 seconds. 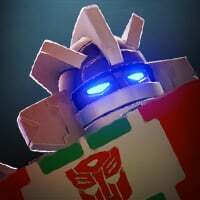 Good Matches: Ratchet, Sideswipe - These bots have powerful healing and power gaining abilities that will be super-charged while under the effects of this module. 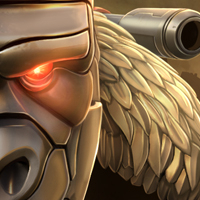 With knowledge of your weaknesses and the agility to strike first, Scout Bots eliminates opponents without recourse. Evades are 20~40% more likely and Evade Buffs last 20~60% longer. Critical Chance Buffs are 25~45% stronger and last 20~60% longer. Inflict Power Lock for 3 seconds. - Evades from the Defender cause the Attacker to suffer from deadly exhaustion. - While Opponent is Power Locked, attacker loses health equal to 3~10% of their Attack Rating for as long as they are Power Locked. Good Matches: Sideswipe - Sideswipe will deal more critical hits, gain more power and evade more consistently denying power from the attacker. You’ll want to avoid Bots that don’t evade well/often or that don’t make use of Critical Hit Rate Buffs. These are the newest additions to the Fight, and will only be available in a Crystal for purchase later this week. This upcoming Crystal will also contain the unreleased 3-Star and 4-Star versions of the Superconductor 1000 and Superconductor 2000 Mods, as well as the formerly Knight Crystal exclusive Transwarp Mod, and it's formerly unreleased 4-Star Version as well. Wow these mods seem OP. Bring it on! Evade is really imbalanced and if there's going to be more evade stuff it needs to have something like it can only trigger on the first hit and not in the middle of combos or they can't attack for 0.5s or something. The AI abuses evade by getting unblockable/unavoidable hits by attacking during the attack animation after their evade procs. It means evade is giving way more benefit than it's supposed to. Instead of just evade it's evade plus a free 5 hit combo. Wow, incredibly promising. Let's see how they improve base defense. I think it's time to replace Superconductor with any one of them. Will this crystal with the new mods be available for energon or will it be added to the raid store rotation? That's exactly what I thought. These mods are going to be insane. @Terminal I know how it feels when AI abuses evasion. But... these mods can only be used on base defense, which has always been a joke. Any boost to it can be justified (to some extent). Evasion is crucial for Scouts with lower health. And this opens opportunity to reconsider your attack squad, bring anti-evaders like Hod Rod, Arcee or Bonecrusher. Double-edged sword it is, anyway. Think about it when you're trying to buy T2A essence. With bringing these mods in, can we address the imbalance of bases? The following is a snap shot of base I came upon. Waste of time As they don’t even have enough chips to raid for. I know I can pass it up for 2 energon, but I shouldn’t be having to pass easy bases. That option to me is to bypass bases that are too hard. The second picture is a snapshot of that persons profile which clearly shows they should be fielding a higher base. I have blacked out the respective name on each photo as my intention is not to dog the person, but the method. How can a person get 35k chips for t3b if they get a base like this once every 3 hours? @Kabam Miike Enter Smoke Screen. Where’s the prime in waiting at? Why do people still think AI abuses evade? Evade works exactly like it should. This means that YES bots can evade out of specials. Bumblebee evades based on his calibration. Pay attention and switch between ranged and melee and keep him switching. Sideswipe gains an evade buff after 7 basic melee hits. He also gains an evade buff after activating his SP2. You can wait out both and no worries. Barricade gains an evade buff anytime he is knocked down. Don't knock him down and no problem. If you do, wait out buff and no problem. Nightbirds Mark gives a small evade chance to any bot on it. I think we talk about "AI abuses" evades because AI takes advantage of them: they know at which hit evade can proc and go back hit us. But evade is a random thing for players. I hate using Bumblebee because his evade often catches me off guard, like when I'm blocking a series of attack, I know I can retaliate on the last hit and I'm preprared, but somewhere near the end... evade! I don't have that kind of reflex time to dash back like AI does. Another probability related ability is Soundwave's reflection. You can't count on it at all to block ranged heavies, you shouldn't even count on it trading shots with enemies because it's not worthwhile. The only situation when reflection doesn't happen as a nice surprise, is when you block ranged specials and pray the last hit to be reflected. That's as sure as praying for a critical hit. That said, scouts are entitled to receive such boost on base defense. These randomly weak matches come up because people suddenly take all their bots off their base. The solution is making sure there's a good reason to keep a strong defense, and that everyone knows about it. Right now, winning defense is the main way to get a sustained increase in medals, so far as I can tell. If you get raided every time you raid, and you win all your raids, the only way to get a net gain is winning on defense. That also takes you out of the raid pool for a little while,. 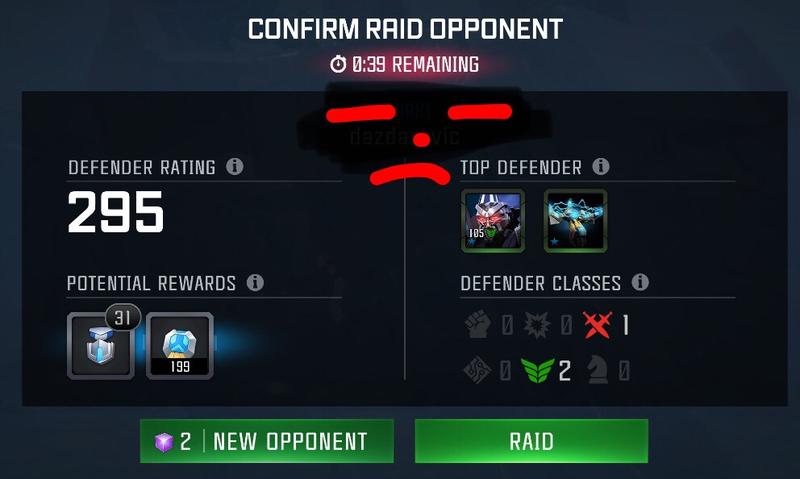 Unless I'm mistaken, this is really the only way to move up the medal tally and gain access to higher point bases and better points in alliance events, and the max featured bot chips per raid in those weeks. The mods look nice. And they need to penalize more chips lost when people with high medal counts sandbag by putting low bots on defense to lose less chips. It’s awesome when someone with 2200+ medal count will have a base defense of 4K and you can only gain 2k chips. @Dircules I agree. I hate having to blow energon to only get 2k chips in a raid. @Kabam Miike What's the selling rate of T1a->T2a? Hope it's not 40, like T2b to T3b. I've noticed an increasing trend over the last few weeks/months with regards to flagging and it's quite concerning. It's being used like a kind of passive aggressive weapon for bullying people that have ideas that are different from theirs.This wastes moderator time as report flags would generally mean a mod gets notified and has to review it. The mods for this forum also have to moderate other Kabam forums, and if they have to waste their time going through erroneous flags they can't reply to questions and comments and they may miss legitimate spam and forum users actually being abused. Let's not waste their time. Let's also not bully forum users. Disagreeing with someone's opinion is not grounds for an abuse flag. Someone having an opinion you don't agree with is not spam. There is absolutely no reason that SIXTEEN posts in this single thread should have report flags. Now, the majority of these are likely from a single user, who the moderators would know, because flagging is obviously not anonymous from their end, only for us, so it's probably already been dealt with (although the flags not being removed is a concern). However, one post, mine, has attracted multiple report flags. By doing this, you're encouraging this kind of behaviour and saying that it's OK. It is not OK and it's not healthy for this forum. It's becoming quite toxic. I do not want to be part of a community where people get bullied like this, where I get bullied like this, and where people thinks it's OK and jump on the bandwagon and pitch in on the bullying. Please flag appropriately and encourage others to do so. No doubt that the mods do a lot to keep things healthy on the forum, we have many posts from them about it and we see the effects on users when their profile pictures change. I feel like this may be getting out of hand and is now at a stage where the mods may need to be even more aggressive in stamping out this kind of behaviour with zero tolerance. Now, about the topic, in an attempt to try and avoid more flags, I'll try to clarify, so that maybe my point of view can be reasonably understood, even if you don't agree with it. I'm not referring to conditional limited evade like bee or sideswipe where skill can be used to mitigate damage. I think evade is a great ability, I think the design language of scouts having evade as a balance for their low health / high attack is also a cool concept. I'm thinking about evade in general, as an ability. These kinds of mods, we could easily get bots in the future with new evade abilities. With things like nightbird mod and these new mods, evade is a permanent, unavoidable baseline. When I think about evade, I believe the purpose is to be a defensive tool, to mitigate damage. In general, evade breaking a combo is annoying, but if that's all it did it wouldn't be so bad (although it would make matches quite tedious). The problem I see is when evade breaking the combo turns into an unblockable/unavoidable (because of the attack frames that triggered the evade) counter combo (again, I only mean things like nightbird or the new mods where it's baseline and we can't avoid it). This makes it an offensive tool for free damage and maybe gives more purpose than what is intended. For me, it seems overly punishing. An example of a simple fix, is just having a tiny lock out period equal to the attack frame animation so the player has a chance to block or evade in return. It could even be something cool with flashy animation like a killer instinct c-c-c-c-combo breaker, resetting the flow of the battle, which I think is more in line with the spirit of the ability. I'm considering this from a more holistic view, not just raids, but future spotlights, mods, AMs, arenas and max rank 4* with evade abilities going in to the future. Honestly, I don't see what's so unreasonable about my thoughts or ideas here that warrants the anonymous abuse of flaggers that I'm receiving. I'd actually love to discuss the ideas that people have about the ability and how we can make the game better, but some people's behaviour on here, I feel like participating and visiting the forums less, no one wants to be abused or targeted in life. Maybe that was your goal. To that end I say well done on achieving your goal, I hope you feel a sense of accomplishment on a job well done. It's pretty hard to stay interested in a game without any community though. If you really thought through your actions, you're just cutting off your nose to spite your face. But your idea is great (I almost skipped it thinking you're reposting general forum etiquette or something LOL): evade should remain "evade" but not "evade and striking back freely". @KillMasterC Unfortunately, it's happened multiple times, in multiple threads, not only to myself but also to other individuals, like poor old Jon, who, yeah may be blunt at times and rub people the wrong way, doesn't deserve the mass amount of spam and abuse flags he's gathered. Seeing it happen once again here, is now too many times for me to not speak out about it. On the other hand, the mass flagging that is also in here is less common, but not the first time either, and more like someone just venting and being a general troll feeling powerless and doing whatever they can to try and reclaim some power in their life. The mods have a keen eye though, so I sometimes see the flags cleaned up later on (for myself and others), so if you check my history you won't see a complete record of it, the most blatant ones are the easiest for the team to catch and clean I guess... but again, that's extra work for them that people are creating unnecessarily and it must be a hassle for them. Is there no topic in which you don't need to write a dissertation on? Mods will take care of flag abusers. Posting stuff like this will actually encourage morons to flag more often. You're practically goading them. Although... If you got off your soapbox one day and never stepped back on it, I'd probably miss you.. I disagree with the idea that evade should only be evade. Bot defense is horrible and one of the few means of causing damage is to get lucky on an evade. Is that a 4 star Superconductor 1000 or 2000? 2000. Goes on Prowl I guess. Yeah, him, IH, or Shockwave.